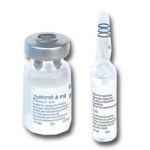 ZoldoNat (Zoledronic acid) by natco is generic version of Zometa.It come in 4 mg in form of Injection. ZoldoNat (zoledronic acid - sometimes called zoledronate) is in a group of medicines called bisphosphonates (bis FOS fo nayts). Zoledronic acid inhibits the release of calcium from bones. ZoldoNat is used to treat high blood levels of calcium caused by cancer (hypercalcemia of malignancy). ZoldoNat also treats multiple myeloma (a type of bone marrow cancer) or bone cancer that has spread from elsewhere in the body. ZoldoNat may also be used for other purposes not listed in this medication guide. Do not receive ZoldoNat without telling your doctor if you have had an allergic reaction to zoledronic acid or similar medicine such as alendronate (Fosamax), etidronate (Didronel), ibandronate (Boniva), pamidronate (Aredia), risedronate (Actonel), or tiludronate (Skelid). Do not use ZoldoNat without telling your doctor if you are pregnant. It could cause harm to the unborn baby. Use an effective form of birth control, and tell your doctor if you become pregnant during treatment. Your doctor may recommend you have a dental exam for preventive tooth and gum care before you start your treatment with ZoldoNat . This is especially important if you have cancer, if you are undergoing chemotherapy or using steroids, or if you have poor dental health. Some people using medicines similar to ZoldoNat have developed bone loss in the jaw, also called osteonecrosis of the jaw. Symptoms of this condition may include jaw pain, swelling, numbness, loose teeth, gum infection, or slow healing after injury or surgery involving the gums. You may be more likely to develop osteonecrosis of the jaw if you have cancer or have been treated with chemotherapy, radiation, or steroids. Other conditions associated with osteonecrosis of the jaw include blood clotting disorders, anemia (low red blood cells), and pre-existing dental problems. Avoid having any type of dental surgery while you are being treated with ZoldoNat . It may take longer than normal for you to recover. 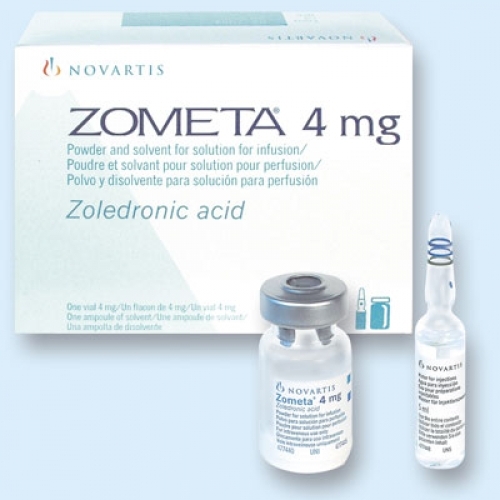 You should not receive ZoldoNat if you are allergic to zoledronic acid or similar medicine such as alendronate (Fosamax), etidronate (Didronel), ibandronate (Boniva), pamidronate (Aredia), risedronate (Actonel), or tiludronate (Skelid). ZoldoNat and Reclast are two different brands of zoledronic acid. You should not be treated with Reclast if you are already receiving ZoldoNat . Before receiving a Reclast injection, tell your doctor if you are already being treated with ZoldoNat . Some people using medicines similar to ZoldoNat have developed bone loss in the jaw, also called osteonecrosis of the jaw. Symptoms of this condition may include jaw pain, swelling, numbness, loose teeth, gum infection, or slow healing after injury or surgery involving the gums. FDA pregnancy category D. ZoldoNat can cause harm to an unborn baby. Do not receive ZoldoNat without telling your doctor if you are pregnant. Use an effective form of birth control, and tell your doctor if you become pregnant during treatment. ZoldoNat can pass into breast milk and may harm a nursing baby. Do not receive ZoldoNat without telling your doctor if you are breast-feeding a baby. ZoldoNat is given as an injection through a needle placed into a vein. You will receive this injection in a clinic or hospital setting. The medicine must be given slowly through an IV infusion, and can take at least 15 minutes to complete. ZoldoNat is sometimes given only once per year. Follow your doctor's instructions. Your doctor may want you to take a calcium and/or vitamin D supplement while you are being treated with ZoldoNat . Carefully follow your doctor's instructions about the type and strength of calcium to take. To be sure this medication is helping your condition and not causing harmful side effects, your blood will need to be tested on a regular basis. Your kidney function may also need to be tested. It is important that you not miss any scheduled visits to your doctor. Contact your doctor if you miss a dose of ZoldoNat . Seek emergency medical attention if you think you have received too much of this medicine. Overdose symptoms may include numbness or tingling in your hands and feet, muscle stiffness, spasms in the muscles of your face, uneven heartbeats, and wheezing or trouble breathing. What should I avoid while receiving ZoldoNat ? redness or swelling where the needle was placed. What other drugs will affect ZoldoNat ? a non-steroidal anti-inflammatory drug (NSAID) such as ibuprofen (Motrin, Advil), naproxen (Aleve, Naprosyn), diclofenac (Cataflam, Voltaren), etodolac (Lodine), indomethacin (Indocin), ketoprofen (Orudis), piroxicam (Feldene), and others. This list is not complete and there may be other drugs that can interact with ZoldoNat . Tell your doctor about all the prescription and over-the-counter medications you use. This includes vitamins, minerals, herbal products, and drugs prescribed by other doctors. Do not start using a new medication without telling your doctor. Your doctor or pharmacist can provide more information about ZoldoNat . 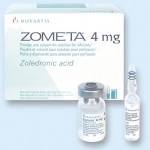 Zoledronic acid is available with a prescription under the brand name ZoldoNat . Other brand or generic formulations may also be available. Ask your pharmacist any questions you have about this medication, especially if it is new to you.